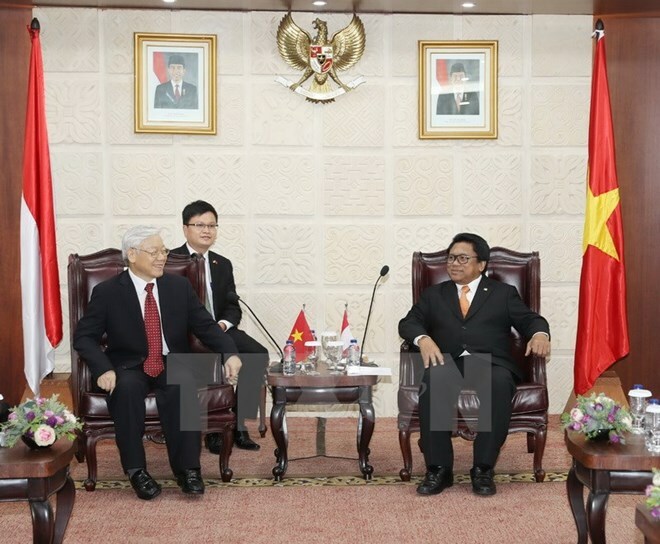 Jakarta (VNA) – General Secretary of the Communist Party of Vietnam Central Committee Nguyen Phu Trong met with Speaker of Indonesia’s Regional Representative Council Oesman Sapta Odang in Jakarta on August 22. The two sides agreed that Vietnam and Indonesia have long-standing relations and both are members of the Association of Southeast Asian Nations (ASEAN), which allow the two countries to promote their relations. The deepening of the bilateral strategic partnership not only satisfies the benefits of their people but also contributes to building an ASEAN of solidarity, unity and strength, thus promoting peace, stability and development in the region and beyond, they said. They added that the development of cooperation between their State power agencies at central and local levels as well as between groups of parliamentarians will help increase the operational efficiency of Vietnam’s National Assembly and Indonesia’s legislative bodies. This will also contribute to increasing political trust and reinforcing the bilateral friendship and cooperation, they said. Party leader Trong congratulated Indonesia on its achievements gained in recent years and highly valued the country’s growing position and prestige in the globe.